The 10 Best Pubs in North Dakota! The word “pub” evokes images of a small, personable bar that prides itself on its delicious food and thirst-quenching drinks. In North Dakota, you’ll find a plethora of classic English and Irish pubs serving fare so authentic, you’ll think you’ve gone to Europe. Check out one of the following locations and see for yourself. With daily specials, an absurd happy hour that includes mystery shots, and live music that will rival any venue, Sidestreet Grille & Pub is one of the hottest bars in the area. Give one of their delicious burgers a try. You won’t be sorry. Fargo/Moorhead’s original Irish pub, a visit to Dempsey’s will be like heading across the pond without leaving the state. Daily food and drink specials, live music on the weekends, and pizza that will ruin you for all other pies. What more could you ask for? One of the newest pubs in the area, Pub West is the newest hot spot for live music, watching the big game, or playing a friendly (or not so friendly) game of darts. 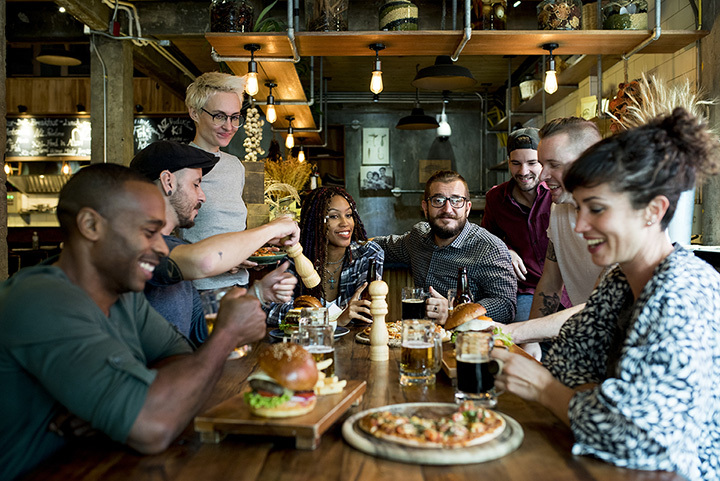 With great food and cool drinks, the pub is ready to provide you with a new favorite hangout. Known for their authentic Irish cuisine, Ebeneezer’s is also home to American favorites as well. The breakfast lovers in your group will be happy to hear that breakfast is served all day. A stacked kids’ menu and weekly events will ensure that everyone in your party has a great time. The Pour House is the state’s only self-serve bar, giving customers the chance to get exactly what they want when they want it. With a wide selection of beer, wine, and spirits and a menu that boasts the most authentic Irish food in the area, there isn’t much you can’t find at the Pour House. Grand Fork’s authentic Irish pub, O’Really’s has an extensive food and drink menu, nightly specials, and live music every week. Their three beer flight options (Irish, Spring, and Custom) are some of the most popular drink options in the entire city. A small, personable, and welcoming tavern with big-time drinks and food menus. Denny’s Tavern may be one of the area’s best kept secrets—until now. Check out one of their burger baskets. Paired with a nice cool beer—delicious. Bismarck is Lucky 13’s Pub’s fifth location, continuing a tradition that includes foods made from scratch and a wide variety of drink options. The pub hosts live music every weekend and is a top destination for watching the big game. A must visit when in Bismarck. Western North Dakota’s original authentic Irish watering hole, the Blarney Stone is known as much for its extensive menu as it is for its drinks. On Saturdays and Sundays, check out the “Diner in Dublin.” Your life will never be the same. One of the most unique bars/pubs in the state, Pops is the perfect location for a relaxed outing that includes fun, good food, and cool drinks. Whether you come for the menu, the karaoke, or the yard games, you are sure to have a memorable visit.